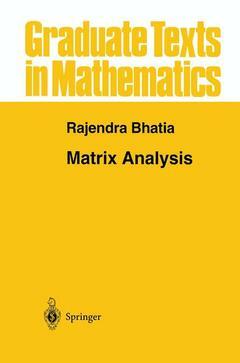 I A Review of Linear Algebra.- I.1 Vector Spaces and Inner Product Spaces.- I.2 Linear Operators and Matrices.- I.3 Direct Sums.- I.4 Tensor Products.- I.5 Symmetry Classes.- I.6 Problems.- I.7 Notes and References.- II Majorisation and Doubly Stochastic Matrices.- II.1 Basic Notions.- II. 2 Birkhoff’s Theorem.- II.3 Convex and Monotone Functions.- II.4 Binary Algebraic Operations and Majorisation.- II.5 Problems.- II.6 Notes and References.- III Variational Principles for Eigenvalues.- III.1 The Minimax Principle for Eigenvalues.- III.2 Weyl’s Inequalities.- III.3 Wielandt’s Minimax Principle.- III.4 Lidskii’s Theorems.- III. 5 Eigenvalues of Real Parts and Singular Values.- III.6 Problems.- III.7 Notes and References.- IV Symmetric Norms.- IV.l Norms on ?n.- IV.2 Unitarily Invariant Norms on Operators on ?n.- IV.3 Lidskii’s Theorem (Third Proof).- IV.4 Weakly Unitarily Invariant Norms.- IV.5 Problems.- IV.6 Notes and References.- V Operator Monotone and Operator Convex Functions.- V.1 Definitions and Simple Examples.- V.2 Some Characterisations.- V.3 Smoothness Properties.- V.4 Loewner’s Theorems.- V.5 Problems.- V.6 Notes and References.- VI Spectral Variation of Normal Matrices.- VI. 1 Continuity of Roots of Polynomials.- VI. 2 Hermitian and Skew-Hermitian Matrices.- VI. 3 Estimates in the Operator Norm.- VI. 4 Estimates in the Frobenius Norm.- VI. 5 Geometry and Spectral Variation: the Operator Norm.- VI. 6 Geometry and Spectral Variation: wui Norms.- VI. 7 Some Inequalities for the Determinant.- VI. 8 Problems.- VI. 9 Notes and References.- VII Perturbation of Spectral Subspaces of Normal Matrices.- VII. 1 Pairs of Subspaces.- VII. 2 The Equation AX — XB = Y.- VII. 3 Perturbation of Eigenspaces.- VII. 4 A Perturbation Bound for Eigenvalues.- VII. 5 Perturbation of the Polar Factors.- VII. 6 Appendix: Evaluating the (Fourier) constants.- VII. 7 Problems.- VII. 8 Notes and References.- VIII Spectral Variation of Nonnormal Matrices.- VIII. 1 General Spectral Variation Bounds.- VIII. 4 Matrices with Real Eigenvalues.- VIII. 5 Eigenvalues with Symmetries.- VIII. 6 Problems.- VIII. 7 Notes and References.- IX A Selection of Matrix Inequalities.- IX. 1 Some Basic Lemmas.- IX. 2 Products of Positive Matrices.- IX. 3 Inequalities for the Exponential Function.- IX. 4 Arithmetic-Geometric Mean Inequalities.- IX. 5 Schwarz Inequalities.- IX. 6 The Lieb Concavity Theorem.- IX. 7 Operator Approximation.- IX. 8 Problems.- IX. 9 Notes and References.- X Perturbation of Matrix Functions.- X. 1 Operator Monotone Functions.- X. 2 The Absolute Value.- X. 3 Local Perturbation Bounds.- X. 4 Appendix: Differential Calculus.- X. 5 Problems.- X. 6 Notes and References.- References.